Roughly bounded by South 5th St., Pierre St.,South 9th St., and Houston St. Architect: Winter, Henry B., Wolfenbarger, Floyd O. Located just south and west of Manhattan's historic downtown commercial center, the 26-acre Houston and Pierre Streets Residential Historic District is characterized by tree-lined streets and late 19th and early 20th century residences. 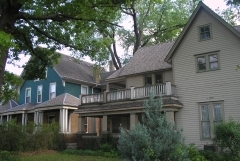 Representing approximately 75 years of new construction, the homes within the district reflect a wide variety of architectural styles including Italianate, Queen Anne, Classical Revival, Tudor, and Craftsman in addition to vernacular folk house forms. The district also includes brick sidewalks and several historic garages accessed from the alleys. The majority of the buildings in the district are of wood frame construction, although some prominent residences feature native stone or brick construction. The district is locally significant for its reflection of the community's residential building patterns associated with the economic growth when the town flourished as a rural railroad market center, county seat, and college town during the late 1800s and early 1900s. The district is nominated as part of the "Late Nineteenth and Early Twentieth Century Residential Resources in Manhattan" Multiple Property Submission. 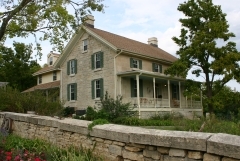 The Samuel Houston House was built in 1857 with plans drawn by John Soupine (stone mason) for use by Samuel Houston and his family. It was built in the National Folk tradition popular at the time, fashioned of native limestone that was locally quarried. 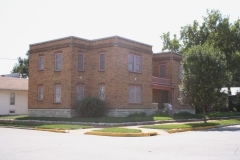 The house was nominated for its associations with the early settlement of Manhattan and Kansas during the territorial period leading up to the Civil War. 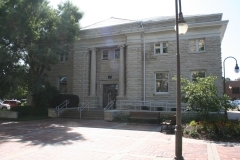 It was also nominated for its association with early Kansas politician Samuel Dexter Houston. He served as a member of the State Legislature and Senate where he helped establish the modern boundaries of Kansas, write the State Constitution and maintained contact with President Lincoln. The residence is architecturally significant for its use of local materials and its early masonry craftsmanship. 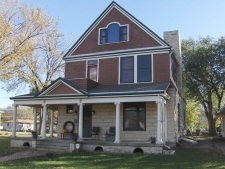 The Hulse-Daughters House (c. 1892) is a two-and-a-half story Shingle-style house designed by Topeka architect Herman McCure Hadley and is nominated for its architectural significance and its association with community leaders. The house was first home to the family of David C. Hulse, a local builder and furniture retailer. Later, the property was owned by Curtis B. Daughters, a leader in local and state Republican Party politics. The Jesse Ingraham House was nominated to the National Register as part of the Late 19th Century Vernacular Stone Houses in Manhattan multiple property nomination for its local significance in the areas of community planning and development and architecture. Ingraham, a native of New York, moved to Kansas in 1856 shortly after the territory was opened for settlement. He took up residence on 160 acres along Wild Cat Creek northwest of Manhattan near Keats, where he and his family lived for ten years before moving closer to Manhattan. Ingraham's relocation and construction of this stone residence in 1867 coincides with the tremendous growth of Manhattan immediately after the Civil War and the initial development of Bluemont College northwest of the city. The house, an example of the gable-front-and-wing property type, was built in stages beginning in 1867 as a gable-front house with a later intersecting wing added in 1885. As early as 1871, Ingraham began transferred parts of his land to the college. What began as Ingraham's farm eventually became a thriving 20th century neighborhood - primarily serving the college - within just a few decades. The house is a good example of well-built vernacular stone building built in phases and is significant for its representation of the evolution of residential architecture in Manhattan. 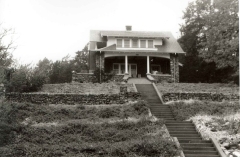 The nominated property was home to Barney Kimble and his wife, Mary Ann, from 1912 until Barney's death in 1920. 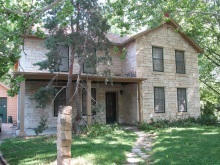 It is a two-story limestone, Queen Anne (Free Classic)-style house with Colonial Revival influences. The form and layout also relate to the American Foursquare with a large hipped roof over the core of the house and smaller intersecting gables on all four sides. The nomination includes the main house and two limestone outbuildings (a stable and a barn), a grouping rarely found within the Manhattan city limits, particularly in an area that has seen growth and change throughout the 20th century. The Kimble House is nominated as part of the Late 19th Century & Early 20th Century Residential Resources of Manhattan multiple property nomination for its local significance in the area of architecture as a vernacular interpretation of the later Queen Anne Free Classic style. Sunset Ave. & Leavenworth St. Although the city of Manhattan had a waterworks facility by the spring of 1888, the town’s first water tower was not in use until 1922. Built between 1921 and 1922, the Landmark Water Tower provided water service to the then-westward edge of town. The standpipe also helped equalize water pressure to the rest of the city, whose residents had become increasingly aware of the citywide problem. 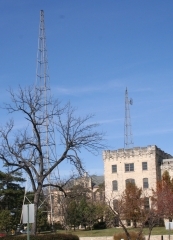 Marked by its unique style, the standpipe features an external winding staircase, a viewing deck that offers a panoramic view of the town and Flint Hills region, and a tall conical spire. Designed by Kansas City, Missouri-based Black & Veatch, the all-steel tower was manufactured by the Pittsburgh-Des Moines Steel Company.